This helps us fight spam accounts and focus on best serving our community of customers and translators. Thanks! This helps us fight spam accounts and focus on best serving our community of customers and translators. This is done for verification purposes only. We will not charge anything to your credit card. Thanks! Your 100 free words have been used up. Human translation requests will now be charged at $0.02 / word - the lowest rate in the industry! Your request for human translation has been submitted successfully! You can track its progress on the Orders page. You will also receive an email notification when the request is completed. Before we start translating, we need to verify your e-mail and activate your account. Please log in to do this translations in this language pair. Do you need more accurate translations? 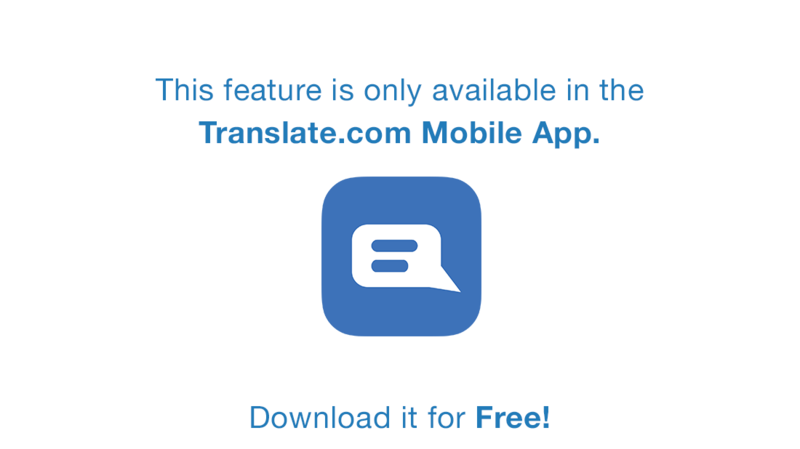 Translate.com offers Human Translations with unbeatable accuracy. Sign up for an account today and get access to our Human Translation Service. Registering for a translate.com account allows you to get Human Translations with unbeatable accuracy. Are you multi-lingual? Sign up for an account and become a paid translator today! I want to order a Human Translation. I want to become a Paid Translator. We're sorry that this translation was not what you expected. Please tell us how this translation can be improved and we will do our best to correct it! Your feedback helps us improve our process and provide the best human translations possible.